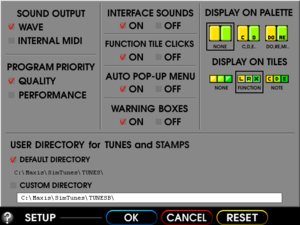 7.2 "SimTunes requires your computer to be set in 256 color mode"
This is the default location used. An alternate save game data location can be chosen via the options menu. Although not a true windowed mode, the game can be run to give the impression. If the desktop resolution is greater than the game, the game will be centered in on the desktop at 640x480. Right click on the SIMTUNES.EXE file (located in the installation folder) and select "Properties". Go to the "Compatibility" tab and enable "Run in 640x480 screen resolution". Run the SIMTUNES.EXE file to play the game. Alternatively, you can go to SIMTUNES.INI (located in C:\Windows) and change UseDirectDraw to TRUE. 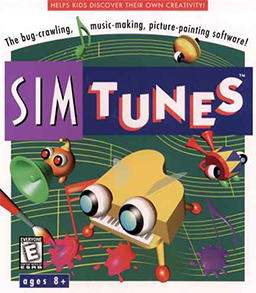 Copy the contents of the SimTunes CD and paste them into the folder that was created before. Once the installer has finished, go to the installation folder and run the SIMTUNES.EXE file to play the game. "SimTunes requires your computer to be set in 256 color mode"
Go to the "Compatibility" tab and enable "Run in 256 colors". For Windows 8 and later, enable Reduced Colour Mode (set to 8-bit color). Open the file SIMTUNES.INI (located in C:\Windows) and change UseDirectDraw to TRUE. This page was last edited on 14 March 2019, at 12:18.